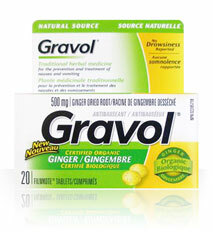 SafeMedicationUse.ca has received 2 incident reports of confusion between the natural-source Gravol product containing the active ingredient ginger and the original Gravol product containing the active ingredient dimenhydrinate (Figures 1 and 2). In the first incident, a patient taking oral chemotherapy had been advised to take Gravol. The patient later returned to the clinic reporting ongoing nausea. At that time, she mentioned that she was taking "nondrowsy" Gravol. The pharmacist realized that the patient had been taking the Gravol ginger product, instead of the Gravol product containing dimenhydrinate. The second incident involved a consumer who in the past had used the Gravol product containing dimenhydrinate to control nausea from migraine headaches. The consumer's husband bought the product containing ginger instead of the product containing dimenhydrinate. He did notice that the product label included the word "ginger" but assumed that the tablets were ginger-flavoured. The consumer vomited and felt a severe burning sensation in her esophagus shortly after taking the Gravol product. A family member examined the label and realized that the product contained ginger instead of dimenhydrinate. Figure 2: Package for Gravol tablets containing dimenhydrinate as the active ingredient. Figure 1: Package for "Gravol Natural Source" tablets containing ginger as the active ingredient. The similarities in the name and appearance of the two products may have contributed to these incidents. This alert will be shared with health practitioners. If you are buying a Gravol product for any reason, ISMP Canada suggests that you read the label carefully and check the active ingredients before making your purchase. 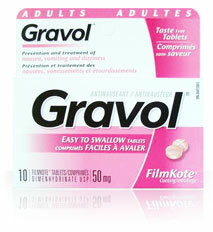 If your doctor or health professional advises you to take "Gravol", be sure you understand which product to take. If in doubt, ask your pharmacist to help you select the right product.